There is a widely prevalent habit now of judging others and labeling them as devotees or Nasthikas (Atheists). What do you know? What can you know of the inner working of another’s mind? There was once a queen who was a great devotee of Lord Rama. 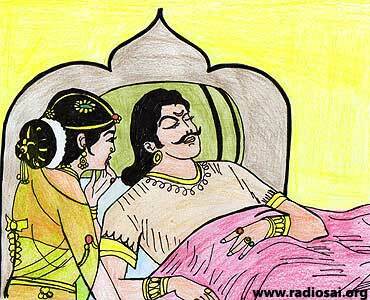 She felt so sad that her husband, the Raja, never even uttered the name of Rama and had no devotion. She had vowed that the first occasion on which she got evidence of his devotion or at least respect for the name of Lord Rama, she would conduct Puja (worship) in all the temples and feed the poor on a lavish scale. 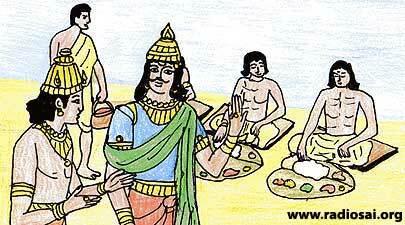 A few days later, one night, while fast asleep, the Raja uttered the name of Rama thrice plaintively and prayerfully. 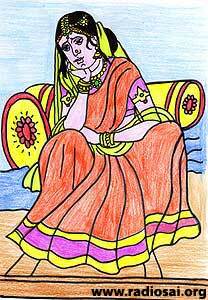 She heard the Namasmarana (chanting of the Divine name) and was happy at the discovery of her husband’s devotion to Rama. She ordered general rejoicing throughout the kingdom and the feeding of the poor. The Raja did not know the reason for the celebration for he was only told that it was an order from the Queen, which the officers carried out. Similarly, a husband may not be aware of the excellence of a wife’s spiritual attainments. There is the case of a couple who were proceeding through a thick jungle on pilgrimage to an inaccessible shrine. The husband saw on the footpath a precious stone, shining brilliantly when the sun’s rays fell upon it from between the leaves. He hastily threw some sand over it with a movement of his foot so that his wife would not be tempted to pick it up and become a slave to the tinsel. The wife saw the gesture and chided the husband for still retaining in his mind a distinction between sand and diamond. For her, both were the same.